There are many different vintage 5 gallon gas cans that you might like to add to your collection. These have become highly collectible and many people are starting to view them as antique collectibles. If you have one out in your garage right now that you are still using. If so, you could sell it yourself and get a good amount of money for it. There are many different brands that have value and many different places you can find them for sale. Check out the list to see if you have any of them or are looking to buy them and need to know what manufacturers and brand names to look out for as you shop. These old galvanized steel gas can were made in 5 gallon size, and other sizes, for many years. They are not worth tons of money, but they are worth more than enough to sell and buy several brand new ones. Of course, if you are just using yours, you can sell it and buy a replacement, putting the profit in your wallet. The old Eagle brand is relatively rare and very collectible. Value: It depends on condition, more than anything else. If it is in very good condition, it can be cleaned out and used for a display piece, which is what most collectors want. Those in good condition can go for well over 50 dollars. Those in average condition might only fetch about $30, but will still generally sell pretty quickly. This one is a little rarer than the Eagle. Made in Clayton, MO, the Imperial Refineries models are a classic example of Americana styling and looks. Most were yellow and black with only a little red on the can, unlike the models today which are all red by law. You will find these for sale on sites like eBay and through antique and collectible sellers online. Value: These are more valuable than most of the other models and brands. Even in rough and rusty shape, they will go for around $75, in most cases. Those in very good, showpiece condition can fetch well over 100 dollars. They are popular with car collectors and automotive collectors and look great when displayed with old oil can collections, even though they are for gasoline. This is another rare and valuable gasoline can for sale, but it is hard to find. They were primarily black, but also generally had orange and white lettering. They have a great look that goes especially well with old oil cans when displayed in a garage or workshop. They are one more classic American example for motor heads and automotive collectors. Value: As stated, it is all over the place. You’ll find them from under 50 dollars to over 100 dollars. They are a good seller, however, so if you have one you would like to sell, you can ask for top dollar and still likely get some action on it. If buying, you can search for the best deals on them and see which is best for you. Few other manufacturers created a gasoline can that had quite as nice of a look at Texaco, but that’s really just my own personal opinion. The Texaco name is quite popular with collectors and they generally get good action when listed at online auctions sites like eBay or on other seller sites. If you can find one really cheap, buy it and use it to add to your collection or to resell for a profit. They are one of the best ones you will find out there for sale. 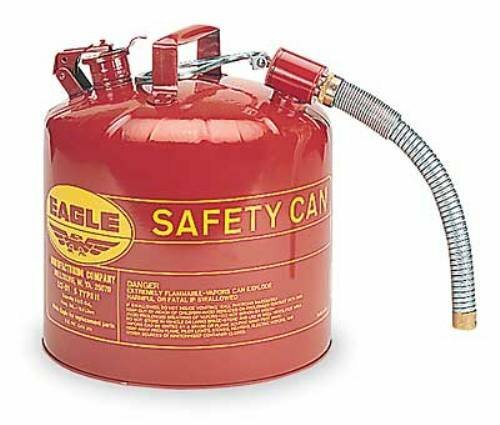 Value: An old gas can like this can easily fetch 100 dollars, even if they are in relatively rough condition. For those that are very nice and could be used for a nice display, you can expect to see price tags of $150 or even $200. That said, if you keep your eyes open, you can find them pretty cheap. I just found one on Craigslist for only $20 that looks to be in good condition. Shop around and get the best and cheapest price you can find. They don’t fetch the higher prices of some of the others, but they are very nice and make a good addition to a collection of automotive cans and accessories. They were primarily red and white, but generally had a green ring at the bottom. Many had a wooden portion of the handle, which is common with many of the old units you will find out there for sale. Value: For the most part, they are pretty cheap, but still worth of collecting. You can find them under 25 dollars. 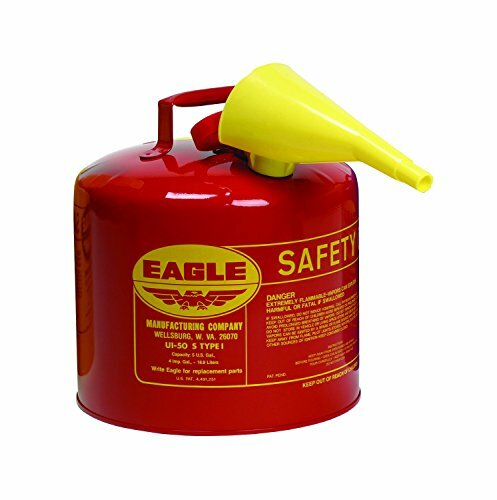 Regardless of the maker, you will have a good chance to find cheap vintage 5 gallon gas cans in a number of different places, if you just keep your eyes open. Listed below are the best places you can search for bargains on them. Yard Sales: You can find retro and antique American gas cans for sale at yard sales. Many people do not realize the value and price them way too low. If the people having the sale are elderly, it seems there’s a better chance of finding them. Auctions: Estate auctions, farm auctions, and others pose a good opportunity to find a good value as you search through what’s for sale in your area. eBay: This is probably the best place to look, since you can find many of them for sale in all sorts of shapes, colors, sizes, and through different manufacturers. You’ll find bargains there, if you keep your eyes open. Amazon: There are many different ones for sale on Amazon at any point in time. You can find good value and deals there. As you look for a vintage 5 gallon gas can for sale, you will have lots of options.